Back when my daughter was, I think, five years old (maybe six), my wife put together this black, construction-paper house (and drew the flower on it, perhaps thinking my daughter would make a ‘cute’ haunted house). And, while I find it completely adorable, my daughter’s version of a haunted house did her horror-fan dad proud. The witch that inspired one of last year’s decorations, along with a black cat, jack-o’-lantern, and sarcophagus. As a teen, the kid didn’t want me putting the haunted house out on display year after year, but grudgingly allowed it, so long as it went back in storage with the other Halloween decorations as soon as November hit. Then, one year while getting out the Halloween decorations, I couldn’t find the house. I feared that the kid had tossed it, in the same way she had gotten rid of other things she deemed embarrassing during her teen years. The flowers, along with the mummy emerging from the sarcophagus, a werewolf, vampire, and a bunch of vicious little roof monsters. As it turns out, the absence of the haunted house was merely due to the complete mess that is my workshop. It had somehow gotten knocked to the floor and shoved up under a storage shelf, plywood blocking the house from view. I went through two Halloweens, not realizing that it wasn’t lost forever, only misplaced. Another view of the witch, cat, and jack-o’-lantern, but with a spider, a version of Frankenstein’s monster peaking out the door, and what I’m assuming is some kind of murdering fiend. When I finally found it, I was overjoyed. I ran into the house and showed my wife, telling her how I thought it had been lost forever, but it was just lost for a very long time. I’m not sure she understood how excited I was, because “overjoyed” for me is usually just mildly obnoxious–well, mildly in my book at least. It was a little beat up, as might be obvious from the photos, but in much better shape than it might have been, given the recklessness with which I had treated it. The witch that the house built–or at least inspired. I got my daughter, emerging from the height of teenage embarrassment at the time, to agree to let me keep the haunted house permanently displayed on the mantle, just to the right of the TV, so, well, it’s at least in my peripheral vision for a while each day. And so I don’t have to worry about it getting lost in my poorly-organized workshop. We’re breaking records for October rain here in this part of the world–as well as having just generally rotten weather–so much so that I kept blowing off putting up the decorations. I still haven’t gotten the lights set out–the big LED lamps that illuminate the whole Halloween display. I’ll get to that as soon as I’m done posting this…and well before I dry out from having just gone out to hang the new decorations. (Yep, taking it down to the wire, despite Halloween and tricks and treats falling on a school night plagued by terrible weather). Both of the new pieces are based on drawings the kid did many years ago, when she was about five. Of course, there are modifications. I’d post images of the source material, but I didn’t ask her permission for that. Maybe later. What is it?!? Isn’t it obvious? So, the ten-armed creature here (which was a twelve-armed creature in its original form) is a random monster from the days when the kid would sit around drawing picture after picture, or very involved pictures with numerous characters. So far as I know, it has no name, and isn’t any particular kind of beast. I always envisioned it as floating about, or perhaps ‘swimming’ through the air. At any rate, it was made to hang from our plum tree. It’s about six-and-a-half feet tall. And, in case you’re wondering, yes, cutting something like that out of a single piece of 4′ x 8′ plywood is rather time-consuming. With an actual, aged broom…y’know, for realism! The witch here was taken from my favorite material object in the entire world…a construction paper haunted house that the kid made all those years ago, with numerous drawings of monsters glued to the outside. Her witch was standing, not flying on a broom. And I added the gym socks. But I think I retained the spirit of the original pretty well. I did some minor updates to the evil candy corn gang as well. Somewhat hard to make out in the pictures, perhaps. But they are all seeing red now. Overall, I had to “update” them by repainting and sealing all of them. Although they were all cut from the same sheet of plywood years ago, the ringleader is starting to warp and crack. Hopefully, he holds up so I don’t have to completely re-create him next year. 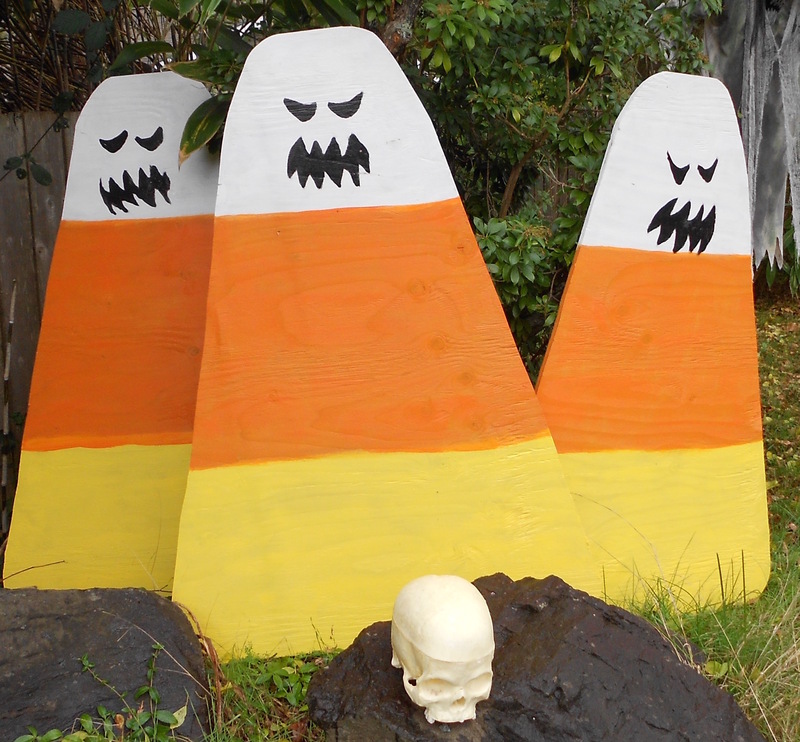 At any rate, the idea for these came from the kid–who, after seeing a “cute” candy corn decoration in a garden center, said that candy corn should not be all smiley and happy, but should appear as it is–evil. 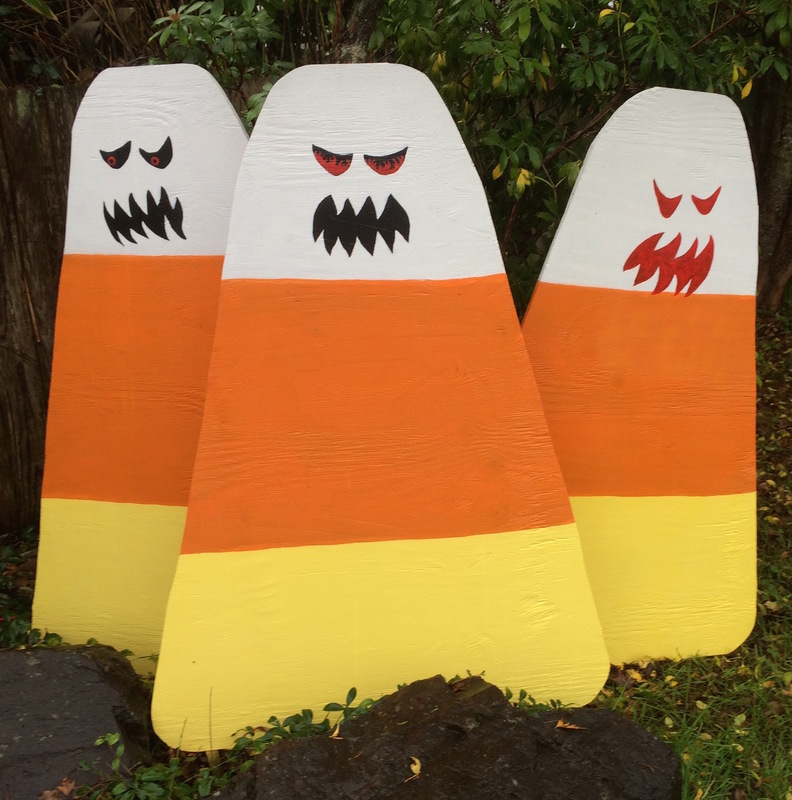 I have been meaning, for years, to make a lot more of these guys, of varying sizes, and then throw some actual candy corn on the ground around them, as if some magic spell has caused them to grow, morph, and attack. One day, maybe. Newly painted, sealed, and slightly more evil.